The Supreme Court today dismissed a challenge to clearcutting licenses initiated by two Grassy Narrows trappers fourteen years ago. Grassy Narrows has reiterated its commitment to protecting the land despite the ruling. 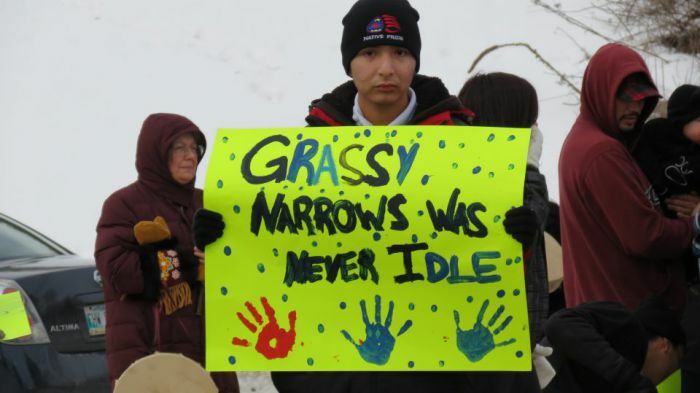 The decision confirms what people in Grassy Narrows have been saying for years: that Canadian institutions are prepared to leave the area with forests turned to desert, rivers poisoned by mercury, so long as they can continue to profit from lucrative mining and forestry licenses. The community’s victories have all come out of their protest and blockade organizing, such as their victory against logging giant Abitibi Consolidated and steps toward an industry boycott. The community is now preparing for a public forum in Toronto at the end of the month featuring Judy Da Silva, Roger Fobister, Leanne Simpson, and Stephen Lewis, to coincide with the River Run—a walk to protect clean water and Indigenous rights. The blockade and this litigation boils down to this: to keep our anishnabe way of life. Our rights flow from the land. If we let it be destroyed or allow sellouts to sell it all away, then there is no more basis for our rights and therefore the anishnabe way of life. While we hoped the Supreme Court of Canada would respect our treaty, we are determined to see Treaty 3 respected. We expect the Government of Ontario and Canada to learn from the last ten years and come to the table ready to deal with the real needs of our people which requires ensuring a sustainable future both environmentally and economically. This has been a long fight and while we are disappointed in today’s outcome we will be continuing to fight to protect the health, welfare and culture of the people of Grassy Narrows using all the tools available to us. We believe Ontario and industry are morally and politically obliged to seek our consent before logging our lands. Our people will ensure that the government, public, corporations, and courts never forget the terrible effect that industrial logging has had on the health and welfare of our people. Whatever the Supreme Court says, as long as we are here we are going to bring our issues to the world. We need to protect our way of life. This isn’t going to change who we are—a land based people that relies on our forests and our water. In my heart, in my feelings we are going to keep doing what we are doing and that is to protect the land and our way of life. Our grassroots women, youth, and landusers will continue to maintain our blockade, our boycott, and our protest along with our supporters from around the world who recognize that we are standing for all life. We will continue to sing our songs, practice our ceremonies, use our land, and heal our people.